Washington sophomore Dillon Steward drives toward the basket during an SCOL game at McClain High School in Greenfield Friday, Jan. 27, 2017. Pictured for McClain are (l-r); Dakotah Duncan and Dalton Mischal. 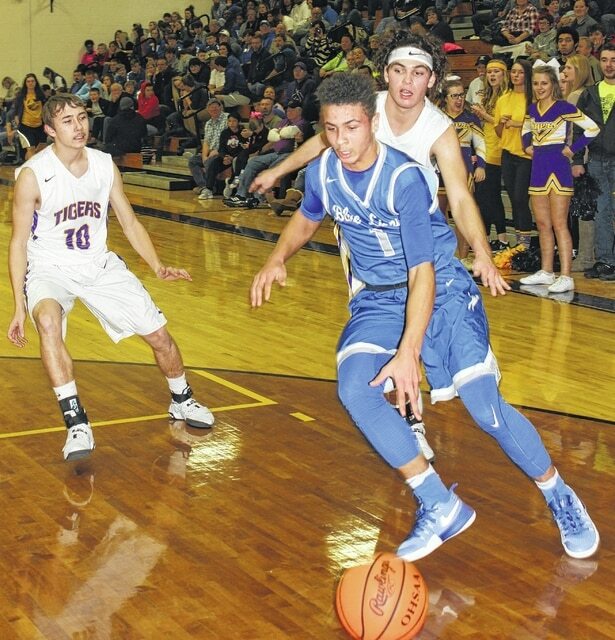 GREENFIELD — The Washington Blue Lions made the trip down SR 41 Friday night to take on the McClain Tigers in an SCOL match-up. McClain won the game, 39-27 to take the season series with the Blue Lions. Washington (7-8 overall, 5-4 in the SCOL) was led by senior Jarett Patton with nine points. For the Tigers (now 6-11 overall, 3-7 in the SCOL), senior Mat Barton led the charge with 18 points. He hit three three-point field goals. Freshman Dalton Mischal had nine points (including two three-point field goals) and senior Jacob Starkey scored seven. It was a tough shooting night for the Blue Lions. Unofficially, Washington made 8 of 39 field goal attempts for 21 percent. They were 2 of 19 from three-point range for 11 percent. They suffered 16 turnovers. Washington made 9 of 10 from the free throw line for 90 percent. McClain (again, unofficially) was 14 of 38 for 37 percent from the floor. They hit five three-point field goals, had 12 turnovers and went 6 of 17 from the foul line for 35 percent. McClain led from wire-to-wire in this game, taking a quick 5-0 lead. The Blue Lions twice pulled to within one point, but McClain was in front, 14-8 at the end of the first quarter. Patton hit a three-point shot for the Blue Lions with 6:50 to play in the second quarter. Washington did not score again until Kenny Upthegrove hit a free throw with 1:20 to play in the half. Both teams struggled in the second quarter (unofficially, Washington 1 for 9 and McClain, 1 for 11 from the field). McClain was in front, 16-12 at the half. Washington got down by as many as 11 points early in the third quarter. They fought back and pulled to within three points, 26-23 at the end of the third quarter. McClain won the fourth quarter, 13-4 to take the win, 39-27. Back on Dec. 13, McClain won at Washington, 51-35. “If you would have told me that we would give up 39 points, I would say we have a pretty good shot to win the game,” Washington head coach Shannon Bartruff said. “Some of it had to do with their defense. We made some poor decisions up top. We didn’t make many shots. WASHINGTON — Dillon Steward 1-2-4; Jarett Patton 1 (1)-4-9; Evan Upthegrove 1 (1)-0-5; Kory Proby 1-2-4; Kenny Upthegrove 1-1-3; Richard Burns Jr. 1-0-2. TOTALS — 6 (2)-9-27. Free throw shooting: 9 of 10 for 90 percent. Three-point field goals: Patton, E. Upthegrove. Turnovers: 16. Three-point field goal shooting: 2 of 19 for 11 percent. Combined field goal shooting: 8 of 39 for 21 percent. McCLAIN — Dakotah Duncan 0-0-0; Owen O’Connor 0-1-1; Brock Dean 0-0-0; Jacob Starkey 3-1-7; Mat Barton 3 (3)-3-18; Jensen Knaff 0-0-0; Dalton Mischal 1 (2)-1-9; Landree Gray 2-0-4; Jay Beatty 0-0-0; Bryson Rickman 0-0-0; Justin Osborne 0-0-0. TOTALS — 9 (5)-6-39. Free throw shooting: 6 of 17 for 35 percent. Three-point field goals: Barton, 3; Mischal, 2. Combined field goal shooting: 14 of 38 for 37 percent. Turnovers: 12.
https://www.recordherald.com/wp-content/uploads/sites/27/2017/01/web1_Dillon-Steward-at-McClain-1-27-17.jpgWashington sophomore Dillon Steward drives toward the basket during an SCOL game at McClain High School in Greenfield Friday, Jan. 27, 2017. Pictured for McClain are (l-r); Dakotah Duncan and Dalton Mischal.